I’m back! Somewhat anyways. We are settling into a routine, but I’m not going to lie, it’s hard. I don’t know how often I will be able to post. I still don’t have a dedicated writing time. Babies are needy and when I do have some free time I have to do things like dishes and laundry! You know that saying, babies don’t keep! So I will try to blog as often as I can while things slowly get easier! 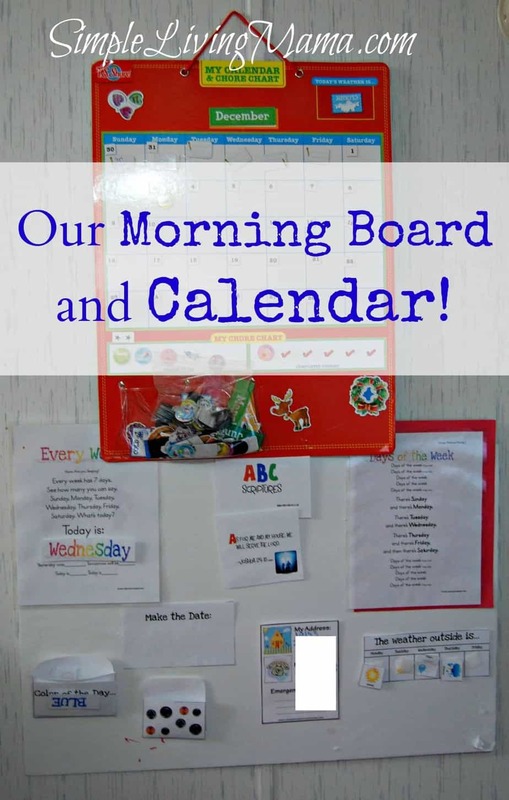 We finally have a morning board and calendar for our homeschool preschool! I’ve been promising this post for a while. 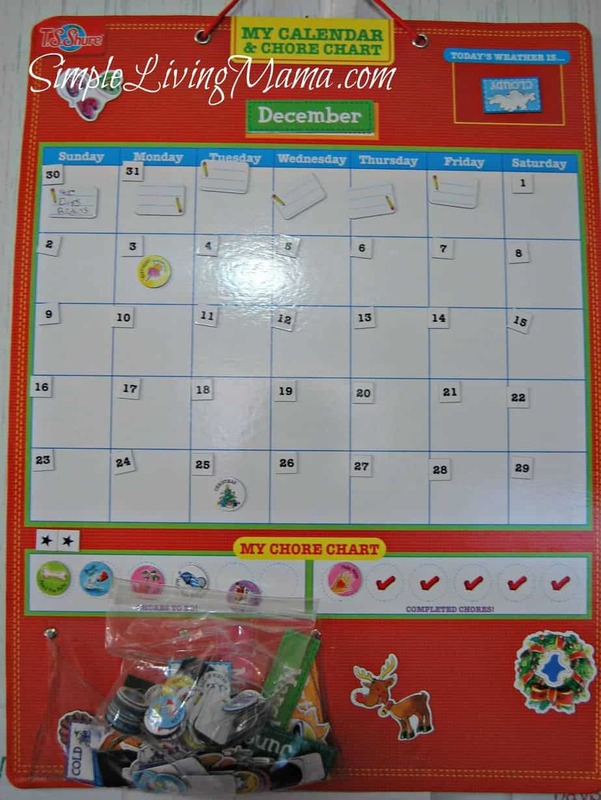 We got a new calendar last month and have greatly enjoyed it in our homeschool. (Sorry for the dark photos. A new lens is on my will get someday list.) The calendar is magnetic and I believe we got it from the ABC Distributing catalog. It was only $16.95. It’s really fun for Bug. There’s a spot to put today’s weather and a little area to decorate with the included magnets for the season. There are tons of magnets. As you can see, I need to get better at organizing them and you must keep them out of reach of little hands! There are magnets for every holiday and activity imaginable. 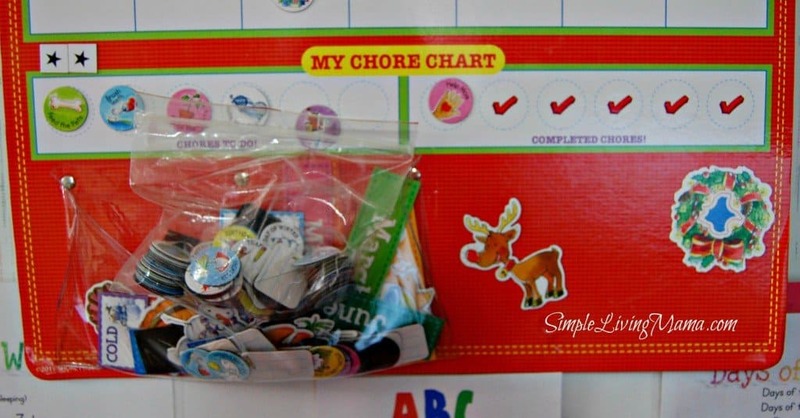 We love the chore chart. Bug gets excited to move the magnet to the “check mark side” when he finishes a chore! Below you will see our morning board. I got most of these printables from Homeschool Creations. I simply used a foam poster board and laminated all of the pieces. I used velcro dots to attach everything. We sing two songs about the days of the week and what day is today. We pick a color of the day and make the date with play coins (the 25th would be a quarter). Our address and phone number are on this board and we will probably retire the weather chart for something else since we do weather on the calendar. I really like the ABC scripture cards. They came from I Can Teach My Child. So that is how we start our homeschooling days! 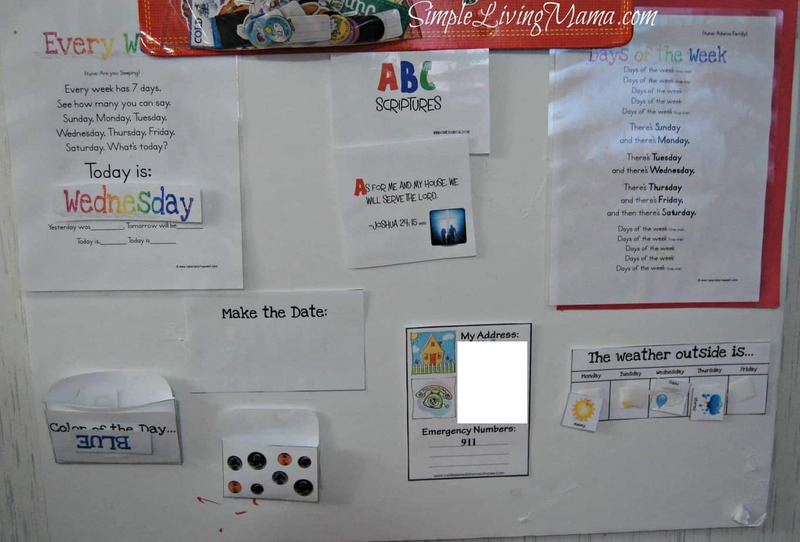 Do you have a calendar or morning board for your kiddos?